Marvel Television is proud to announce acclaimed animator and illustrator Pascal Campion (Iron Man, All-New Invaders) as the newest recruit for Marvel’s Agents of S.H.I.E.L.D. : The Art of Level 7, a new initiative uniting top artists from around the world to celebrate the final six episodes of the series’ inaugural season(airing Tuesdays, 8|7c on the ABC Television Network). As Hydra continues their war against the remaining Agents of S.H.I.E.L.D., Phil Coulson finds the enemy targeting him where it hurts the most – the woman he loves! In the latest episode of Marvel’s Agents of S.H.I.E.L.D., Coulson is on a mission to save Audrey Nathan, the cellist who won his heart and whose life is threatened by the dangerous Marcus Daniels (AKA Blackout). But as Coulson faces one of the deadliest enemies from his past, a threat closer to home may be his undoing! “The Only Light In The Darkness”, the nineteenth episode of the series, premieres on Tuesday, April 22nd, at 8|7c on the ABC network followed by brand new episodes each week until suspenseful season finale. Each poster released in this series will be available as limited edition high quality prints at http://www.marvelstore.com/ArtOfLevel7 with “The Only Light In The Darkness” scheduled to go on sale Friday, April 18th at 1:00am PST. These individually numbered prints are strictly limited to 100 copies and once they’re sold out, they won’t be available again from Marvel. “Working with Marvel is a childhood dream come true. 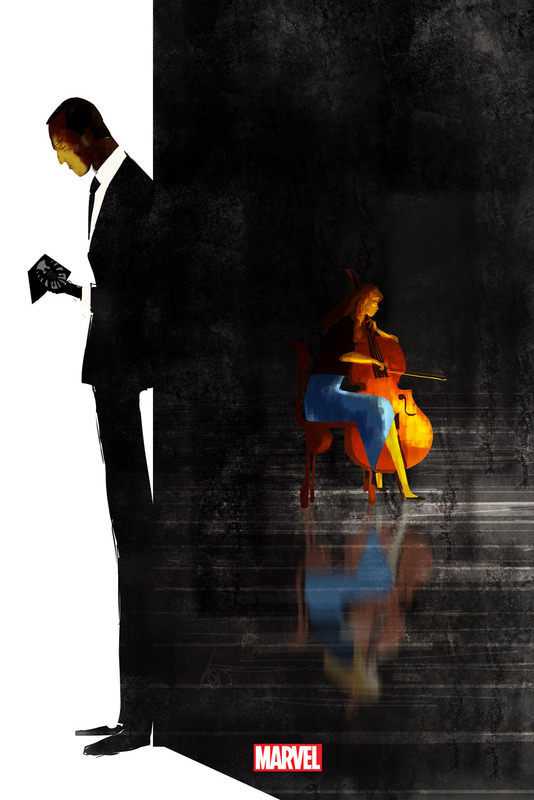 I’m thankful for the opportunity to partner with Marvel’s Agents of S.H.I.E.L.D.,” said Pascal Campion. For more information on Marvel’s Agents of S.H.I.E.L.D., please visit marvel.com or www.abc.com. Join the conversation on Twitter and get all the latest updates with @AgentsOfSHIELD and @Marvel.